The Butler softball team gathers at the mound for high-fives. The Bulldogs went 1-4 in the first tournament of the year. Collegian file photo. 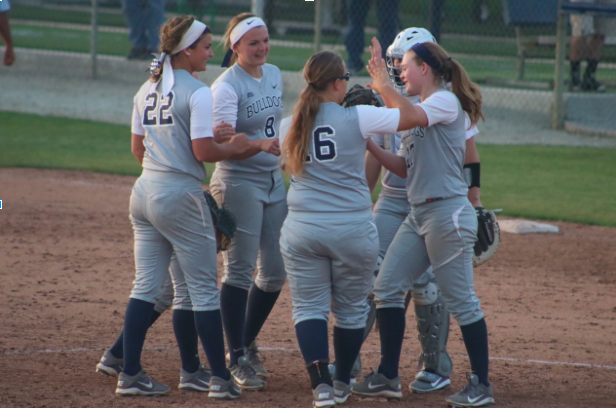 The Butler University softball team lost four of its first five games to open the season at the Friends of Jaclyn Invitational in Longwood, Florida, from Feb. 9-11. The Bulldogs started the weekend with a 5-2 loss to the University of Louisville and 5-1 loss to the University of Central Florida. In the first game, Butler scored both of its runs in the first inning on an error and bases-loaded hit-by-pitch. Louisville scored three unearned runs combined in the second and third innings before tacking on single runs in the fifth and sixth frames. Freshman pitcher Alyssa Graves took the loss in her collegiate debut despite allowing just one earned run in five innings and striking out seven. Junior outfielder Jenna Foreman went 3 for 4 at the plate. In the second game, Central Florida scored four runs in the top of the first inning and one in the third off of junior infielder/pitcher Kaitlin Doud. Butler’s sole run came in the fourth inning from a three consecutive two-out singles. Sophomore infielder Christina Candotti had a strong game at the plate, finishing 3 for 3. Butler lost its first game of the day on Saturday, falling to the University of North Carolina 7-4. Foreman went 3 for 4 at the plate while Graves took the loss, surrendering five runs in four innings. The team was able to pick up its first win of the season later in the day against the University of North Florida. Sophomore pitcher Gabbi Schnaiter threw a shutout for the Bulldogs, scattering three hits and two walks across seven innings while striking out three. Butler manufactured single runs in the first and sixth innings for a 2-0 victory. The Bulldogs dropped their final game of the weekend to the University of South Alabama on Sunday morning. South Alabama’s Alexis Reid no-hit Butler, and the Jaguars scored one run in the first inning followed by four in the second and one in the fifth for a 6-0 win. Butler returns to action next weekend, Feb. 16-18, with a five-game event hosted by Texas A&M University in College Station, Texas.